The Raglan Road Mighty St. Patrick's Festival presents three days and nights of live Irish music March 15-17 headlined by one of Celtic rock's hardest working bands, the Young Dubliners. 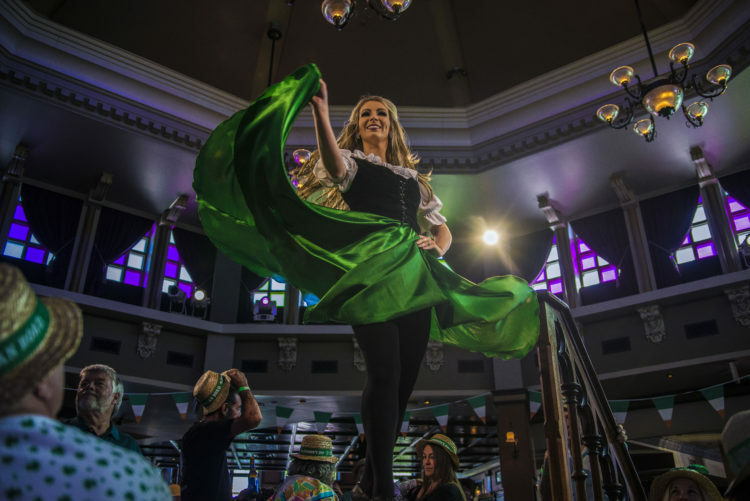 Nine bands in all join the talented Raglan Road troupe of Irish dancers to feature non-stop entertainment from mornings and on into late night during the annual celebration. Raglan Road co-owner John Cooke says fans of the annual celebration of all things Irish will be sure to hear something new: "We'll also mix it up with some unique musical collaborations by our in-house artists." Plan ahead for the fun. On March 17, St. Patrick's Day, guests will be seated on a first-come, first-served basis with a $10 cover charge for each guest age 18 and older. Reservations can be booked for other festival days (no cover) by calling 407/938-0300. Guests can enjoy a mighty selection of beers, whiskeys, and craft cocktails to pair with exceptional pub grub and more elegant Irish fare while musicians and dancers perform on multiple stages, indoors and out, from 3pm to 1:30 a.m. March 15 and 11 a.m. until 1:30 a.m. March 16 and 17 (Pub opens at 9 a.m. for seating Saturday and Sunday). Mighty Festival guests can accent their Irish holiday attire with complimentary face painting March 15 from 3-9 p.m. and March 16-17 from 10 a.m.-8 p.m. The entertainment schedule will be posted at raglanroad.com. Young Dubliners - One of Celtic rock's hardest working bands, the Young Dubliners play hundreds of shows to thousands of fans across the United States and Europe every year. Young Dubliners are known for their hearty rock and Irish-infused live performances. Ben Gunnery - Irish music superstar and multi-instrumentalist Ben Gunnery, who studied at prestigious music conservatories, has toured since age 14. Now 39, he has been soloist for high-profile productions like Riverdance and films including "Lord of the Rings" and Harry Potter movies. Ben will appear on Raglan Road stages for his first Mighty Festival. Briste - This inspiring all-female duo includes Emma Robinson (flute, whistle) and Joanna Boyle (banjo, vocals). Blending their rich musical backgrounds, Briste creates a fresh and exciting mix of country, folk and Irish traditional music. The Byrne Brothers - An exceptionally talented traditional Irish music family from Donegal. They are Luca, 14 (button accordion); Finn, 12 (banjo, mandolin and whistle); Dempsey, 9, (whistle and bodhran); and father, Tommy (guitar, Uilleann pipes, fiddle, whistles, bagpipes and bodhran). Their show combines exciting Irish tunes with modern dance beats, and they love to interact with every audience. The Raglan Roots Coalition - This edgy house band is known for its soul-rockin' Celtic bluegrass with hip-swingin', knee-shakin' funky roots beats. Emily Furlong (guitar, vocals, banjo); Blain Curtis (guitar, vocals); Ben Roe (percussion); Keelan Kelly (bass); and Ellen Daly (fiddle) will get everyone in the St. Paddy's spirit. Reel Republic - Hailing from the four corners of Ireland, Aisling Egan-Sage (fiddle); Liam O'Keefe (box, vocals); Niall McIlroy (guitar, flute); and Eleanor Roe (keyboard, vocals, bodhran) are Reel Republic 2.0, seriously talented musicians always pushing to make the next gig better than the last. Trad Gad - Three talented musicians from Kerry, Dublin, Colin Foley (guitar, vocals); Fionn Morrison (Uilleann pipes, whistles); and Ciara Ni Bhrian (guitar, fiddle, mandolin, Uilleann pipes, tin whistle, banjo and bazouki, charm Raglan Road audiences with their vibrant performances. Maca - Three Irish sister-musician-songwriters dubbed "Ireland's next big thing" are rocking Raglan Road Pub stages with their extraordinary talent. Saoise Carty (guitar,vocals); Naoise Carty (Fiddle, vocals); and Ciara Carty (Bodhran) are from Wexford, Ireland. High Road - Three talented musicians hailing from Galway, Kilkenny and Glasgow meet in the middle to play a crowd-pleasing symphony of traditional Irish tunes and songs. Hannah NcNeil (fiddle, banjo, vocals); Aidan Byrne (guitar, vocals); and Roisin Broderick (concertina) rock the stage. The Raglan Road Irish Dancers - Plucked from the cast and stages of the world's greatest Irish dance shows, the Raglan Road Irish Dancers perform throughout the Mighty Festival. You can even learn some traditional Irish dance steps - no experience necessary! Guests can order from Raglan Road's brunch, lunch, dinner and bar menus that include new menu items like the Guinness-infused Bangin' Bangers and Mighty Mash and In Cod's Way - pan-seared north Atlantic cod with lemon and herb crushed potatoes, garden peas with tomato and caper butter sauce. Traditionalists can dig into the pub's loin of bacon and cabbage, the authentic Irish dish of St. Patrick's Day, plus other pub classics. Throughout the event, the restaurant's Cooke's of Dublin counter-service eatery will offer Irish favorites, as well, including fish and chips, now available by mobile ordering.